This economic thing (which we are calling the “Great Recalibration”) is something that grabbed ahold of all of us late last year, and it wouldn’t have been something we’d have ordered, but we are finding some pretty significant silver linings to this cloud. It has caused us to double down on many of our commitments to be of genuine service to our community of guests and our community of staff members. Read on and you’ll hear some about that and also learn about some special things we’re doing around the holidays, plus the scoop on a really exciting art project. Lucky’s has changed—but not too much. Our culinary journey during the past few years with Chef Jay Pierce has been carrying us toward Southern foodways and locally-sourced food. So we’ve fully embraced this adjusted trajectory and, after 20+ years, we’ve even changed our name—to Lucky 32 Southern Kitchen! What’s more, we’re offering his amazing side dishes, like boiled peanut and butternut squash succotash and his incredible collard greens, as optional sides with most any menu selection. I’ll bet that makes Lucky’s the only “meat-and-three” joint that has a Wine Spectator Award of Excellence. You’ll flip for our pulled pork over johnny cakes, chicken & dumplings and our delicious side dishes such as vegetarian beans & greens (black-eyed peas and kale). We even serve authentic pot liquor with corn bread for dipping. Don’t worry—legacy dishes, such as black bean cakes and chicken tomato basil soup, are still on the menu. We’ve even spruced up Lucky’s in both Greensboro and Cary, so you’ll be more comfortable than ever. I might be taking this “tickled pink” thing a little too far, but that is also how I feel about the way the Proximity has matured. We were concerned during the design process that some of our efforts to use less energy and other resources while giving our guests more natural light and extraordinary indoor air quality might somehow blow up in our face. But our neurotic fear served us well, because we now have the hard evidence (read: energy bills) and guest feedback saying that we really are using 39% less energy and 33% less water, while providing 20% more filtered dehumidified outside fresh air and loads of natural light. So it didn’t hurt our guest experience, but helped. What a great place to stay! P.S. Order your free copy of the NC Travel Guide that features us on the cover at visitnc.com. I’ve been playing restaurant and hotel since I was 15, so for the past 37 years (you do the math), I reckon that I’ve spent at least a part, if not a good bit, of over 10,000 days in restaurant kitchens. But I’ve never had an experience like I had with Chef Leigh Hesling and Managing Director Martin Hunt the other day. I’d asked if I could spend the day with the two of them wandering around the kitchen so I could offer feedback and discuss some possible new kitchen equipment. About two hours into this “walk-through” I realized that I’d never seen a kitchen this well put together. The cooks were focused, the place was immaculately clean, the refrigerators and pantries were organized and tidy. I felt like I was dreaming because I’m a pretty tough customer and quite often in these sorts of situations I find myself holding my tongue. But this time I was emotionally moved like one is when one’s dreams come true. And to see Chef Hesling glow with enthusiasm when I asked him about some farmstead cheeses that he’s added to his selections or about the new olive oil he’d found, I was even more deeply moved. (What is accomplished without enthusiasm? In my experience, not much . . . and this Chef has it dripping from him, not just about his food but also about his crew.) What a great morning. I went home that night and opened a bottle of champagne with my bride and made a toast to Leigh and Martin. And, guess what? That was a few weeks ago. I know, as sure as I know I love my family and friends, that it takes this kind of effort every day to keep a kitchen operating at this level. We know we are only as good as the last meal we served! I know that I’m not objective, but I have loved Print Works from day one. We realize that we left our too small, too limited “opening menu” in place for too long. Sorry! We’ve heard that a lot. Now we’ve fixed it, and the menu has a boatload of offerings, plus each week we have a different Prix Fixe menu that even further broadens the selection and offers a great value. The food here is really good. Honestly, I dine in one of our three restaurants here in Greensboro at least seven times a week, and sometimes I have to flip a coin because I love dining in all three—but for different reasons. Turkey-to-Go:Enjoy Green Valley Grill’swonderful cooking with Thanksgiving-to-Go.Place your order by 10 p.m., Monday, November 23, and then stop by on Thanksgiving Day to pick up your juicy, wood-fired, rotisserie-roasted turkey with all the trimmings, including sides, salads, bread and dessert. To make your reservation or to place your order, call Green Valley Grill at 336-854-2015 or visit greenvalleygrill.com. Christmas Dinner-to-Go:Enjoy Christmas morning around the tree instead of in the kitchen. Let Print Works Bistro do your cooking with its inaugural Christmas Dinner-to-Go. Place your order by 10 p.m., Monday, December 21, and then stop by on Christmas morning to pick up your holiday feast. 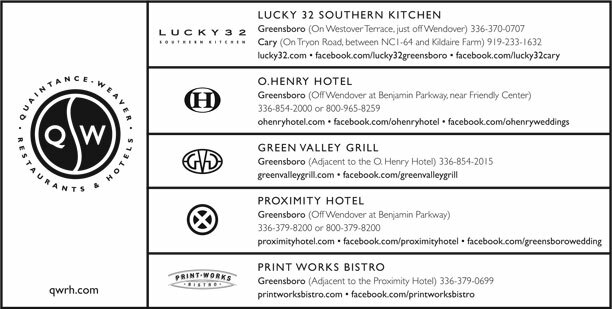 To make your reservation or to place your order, call Print Works Bistro at 336-379-0699 or visit printworksbistro.com. Thanksgiving & Christmas Dining:While Lucky 32 won’t be open, you can bring your clan to Green Valley Grillor Print Works Bistro. Their dining rooms will be open 12 noon–8 p.m. (with several holiday specials) and the bar will be open until 11 p.m. on Thanksgiving with the late night menu. To make your reservation, please contact Green Valley Grill at 336-854-2015 or greenvalleygrill.com and Print Works at 336-379-0699 or printworksbistro.com. of the holiday season on two Sundays, December 6 and 13,at 2 p.m. Dreams of dancing sugar plum fairies, toy soldiers and waltzing flowers have inspired the special treats that will accompany your choice of tea, warm apple cider or hot chocolate. Afterwards, each child can decorate an ornament and help our chefs make ginger bread houses; all accompanied by music and costumed characters. Afterwards, join Clara by the tree as she reads The Nutcracker. Bring your camera! Cost is $38 per person for adults and children, plus 20% service charge. Call Green Valley Grill at 336-854-2015 for reservations. Gift Certificates:You can order Quaintance-Weaver gift certificates that can be used at any of our businesses by going to qwrh.comor calling our Gift Certificate Hotline at 336-370-0966. We’ll put the gift certificates in the mail to you, or to the fortunate recipient. Group Celebrations:Bring your bunch to our restaurants or hotels for a festive celebration. We offer reservations, call-ahead seating and even a pre-ordering service that expedites service for larger parties. At Lucky 32,order from our full menu in our private and semi-private dining areas. At Lucky’s in Cary, we can handle up to 70 people in our semi-private dining area! In Greensboro, their private dining room seats 10, and they can host larger parties in the dining room. To enjoy the extraordinary food from Green Valley Grill or Print Works Bistro in the beautiful private event spaces of the hotels, please contact the events team at 336-544-9615 (O.Henry) or 336-478-9111 (Proximity). We can host an intimate gathering of 15 or a bash for 150. Get Lucky & PARTY!No time to prepare that covered dish? Let us cook for your office gathering or weekend party. You call, we cook and we bring your order right to your car when you arrive. Pick up half-pint and pint options of collards, soup, beans and greens, whipped sweet potatoes, creamy grits, pimento cheese, artichoke dip, and don’t forget the black bean cakes. For complete Get Lucky & Gomenus, visit lucky32.com. Give yourself or someone else the perfect gift this holiday season and stay with a Holiday Package at O.Henry Hotel. Gift of the Magi Package: Here is a respite from the frantic holiday season. The package includes a copy of O.Henry’s short stories, a $30 voucher for Green Valley Grill and other amenities such as Afternoon Tea. The package also includes a full hot breakfast buffet, and a late check-out of 2 p.m. the next day for only $199 plus tax. Available on Friday or Saturday nights from November 13th until December 13th, or any night from December 14th until January 10th, 2010 (excluding New Year’s Eve). $210 in 2010 Package: Celebrate the arrival of the New Year at the O.Henry Hotel with priority reservations at Green Valley Grill on New Year’s Eve, a champagne toast for two, and a full, hot breakfast buffet for $210 plus tax. Stay for two nights for only $310 plus tax, which also includes breakfast in bed for two during one of the mornings of your stay. You don’t have to travel far to feel as if you are miles away from home with Proximity’s Holiday Packages. Sustainable Cheer: Stay on a Friday or Saturday night from November 13th till December 13th, or any night from December 14th until January 10th, 2010 (except New Year’s Eve) and receive a special rate of $199, which includes a $30 amenity voucher for Print Works Bistro or other hotel amenities. Celebrate the Holiday Season by checking in at 2 p.m. and take a ride in our London Taxi to the Friendly Center for holiday shopping. When you return, enjoy a very special lunch or dinner at the Print Works Bistro. $210 in 2010 Package: Say goodbye to 2009 and welcome 2010 at Proximity! The $210 in 2010 package includes priority reservations at Print Works Bistro on New Year’s Eve and sparkling wine to toast the New Year for $210 plus tax. Have twice the fun with a two-night package for only $310 plus tax, which also includes breakfast in bed for two, both mornings. New Year’s Day Menus:Make sure that 2010 is your luckiest year ever by joining us at Lucky 32 on New Year’s Day. We’ll feature our full menu plus some “good luck” special selections like collard greens, country ham with red-eye gravy, and Hoppin’ John. Print Works will also have a special New Year’s menu. Our friends at the Green Hill Center for North Carolina Art in downtown Greensboro will have their 30th anniversary of the wonderful Winter Show on December 6–January 15. This show will spotlight the talents of 150 artists from across North Carolina, from Penland to Pamlico. More than 500 art pieces will be for sale, starting at just $50. This is the largest collection of North Carolina artists featured in one show. Now that’s something to see! We are partnering with them this year by offering a “Winter Show Package” for $199 at both the O.Henry and Proximity Hotels, including an overnight stay and a $50 certificate to spend at Green Hill. Also, if you attend their opening gala on December 5, we’ll provide transportation to and from the big event. Go to printworksbistro.com for this yummy holiday recipe..